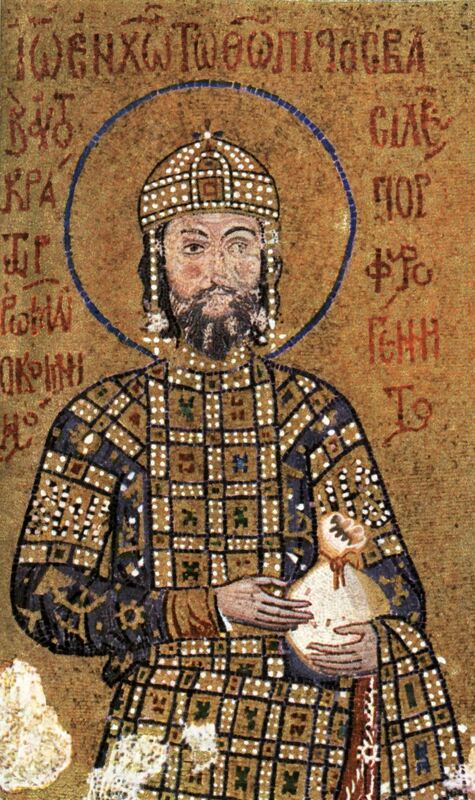 John II was Byzantine Emperor from 1118 to 1143. Also known as "John the Beautiful" or "John the Good", he was the eldest son of Emperor Alexios I Komnenos and Irene Doukaina and the second emperor to rule during the Komnenian restoration of the Byzantine Empire. John has been assessed as the greatest of the Komnenian emperors. In the course of his twenty-five year reign, he made alliances with the Holy Roman Empire in the west, decisively defeated the Pechenegs, Hungarians and Serbs in the Balkans, and personally led numerous campaigns against the Turks in Asia Minor. John's campaigns fundamentally changed the balance of power in the east, forcing the Turks onto the defensive and restoring to the Byzantines many towns, fortresses and cities right across the peninsula. Having prepared his army for an attack on Antioch, John amused himself by hunting wild boar on Mount Taurus in Cilicia, where, on April 1, 1143, he accidentally cut himself on the hand with a poisoned arrow. John initially ignored the wound and it became infected. He died a number of days after the accident, on April 8, probably of septicaemia.